What do young people have to say about youth unemployment and why we should listen to them? The good news: the levels of youth unemployment in Europe are slowly dropping down. According to data presented by the European Commissioner for Employment Marianne Thyssen during this year’s edition of the European Youth Event, by March this year the number of young unemployed decreased to 4.3 million. In her words, this marks a drop of 25 percent compared to December 2012 when youth unemployment rates in Europe peaked and some 5.7 million youngsters in the European Union (EU) were unemployed. The bad news: youth unemployment in Europe is segregating. In countries such as Italy, Spain and Greece, the rates of jobless youth are still around 35 percent. Moreover, the phenomenon of skills mismatch is becoming more and more visible across Europe. European data shows that 30 percent of third-level graduates are working in jobs that do not require their level of qualification, while 40 percent of employers say they can not find people with the right skills. Labour market mismatches, or the situation in which many vacancies remain unfilled due to inadequate knowledge, skills and working experience, is one of the problems lying at the heart of youth unemployment in the European Union today. The issue is so serious, that the Commissioner refers to it as a “tragic waste of the collective talent of young people”. “Young people feel that Europe no longer protects them properly. They feel marginalised and excluded from the economic and social life”. This is a dangerous path that the EU is headed to, because young people who are neither in employment nor in education or training (the so-called NEETs) and who feel marginalised at the same time are more vulnerable to negative external influences. So, what are the ways to close the gap between acquired skills and expected qualifications? The European politicians count a lot on the involvement of business and the employment opportunities is willing to finance, develop and eventually secure. Commissioner Thyssen is convinced that education and training systems have to be in balance with the needs of employers. Do young people feel that their education or training institute is preparing them successfully for the job market and what is their solution for closing the gap between knowledge acquired at the university and the skills expected on the job market? 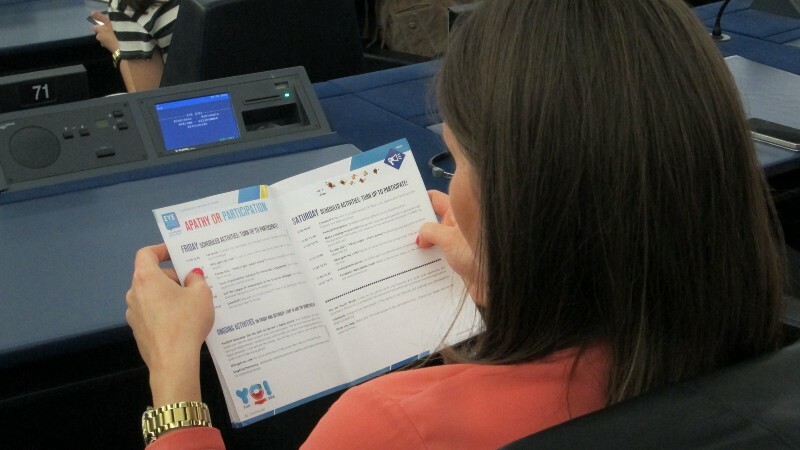 The randomly recorded audios during the European Youth Event in Strasbourg below provide a quick glimpse on the attitudes and ideas of young people. Italian Francesco believes that he has been given the right skills, but considers that often the education system is more focused on providing knowledge bits without providing on how to manage these knowledge bits. Amna from the United Kingdom did not initially feel that her school had prepared her successfully for the requirements of the job market. She sees the gap in the fact that the voice of young people often remains unheard. Portuguese Juan is a PhD candidate. He believes it is important to differentiate between university education and the polytechnic style of teaching which is more practice-oriented. He believes that the drive towards progress of universities leads them to becoming more practice-focused. Juan is also one of those young people who strongly believe that apprenticeships and internships have to be paid. “I don’t think work should be for free at any time, even if it is students’ work. Students breathe free, but they still need to eat and drink, so the internship should be paid somehow”. According to Miroslav Hajnos who is heading the international relations department at the Slovak confederation of trade unions, part of the problem stems from the fact that young people are not informed about their labour and social rights. Anne Sander MEP sees another big issue the fact that that currently there is no official trainee status within the European Union — trainees have different status in different countries, ranging from employees to young students. Talking about the involvement of the business in fighting youth unemployment, one can not omit the various calls made during this year’s European Youth Event towards young people to become entrepreneurs and start their own business. “Why aren’t there more young people who feel equipped and supported to set up their own business?”, asked Commissioner Thyssen in one of her contributions during the conference. The answers to this question can be found below, in the result of a randomly recorded Q&A session on the corridors of the European Parliament on 20 May 2016. The majority of young people who took part in the Vox Pop seems to feel unprepared to open their own business or is unwilling to do so. Every single one of the participants has their own reason behind the response given, but what strikes is the gap which exists between the general attitudes of young people in Europe and the plans which European politicians have for them. On that account, pan-European events such as the European Youth Event, bringing young people to dialogue with the EU bureaucrats, are indeed an invaluable opportunity to give the new generations a voice, but also to secure uniformity between their actual situation and the policies which are being planned and prepared for them.